Given the exceptional privilege to serve as the 10th president of Riverside Military Academy, I am both honored and excited to join a talented team of educators, military leaders, staff and innumerable community members who strive to enhance the mission of the Academy. Further, I cannot begin to express my admiration and thanks for the outstanding leadership LTC James G. Spivey, USA (Ret) provided to Riverside throughout the past year as Interim President. Inspiration– More than by motivation, young men are driven to grow and excel when inspired by the behaviors and achievements of those they respect. Our collective efforts must inspire RMA cadets to levels of academic achievement, leadership, and physical stamina they never thought they could possibly achieve. When inspired by role models across the Academy, each cadet’s personal achievements provide the foundations for a lifetime of success. Investment – The Riverside legacy, represented by its beautiful campus; successful alumni, and, most importantly, its 540 enrolled cadets, is worthy of our collective investment of time, talent, and treasure. We will make systematic strategic investments in employee professional development, facility quality, campus safety, and cutting-edge programming in ways that benefit the cadets who are entrusted to our keeping. The greater each of us invests in Riverside, the faster and easier we execute our mission, graduate tremendous cadets, and separate ourselves from all other academies. 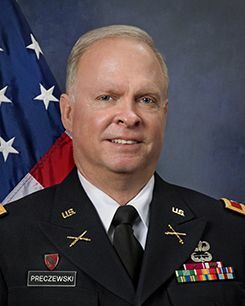 Twenty-six years of active service in our Army, decades of work in higher education environments, and three years of service on the RMA Board of Trustees have uniquely prepared me to serve this enviable institution. Together we will continue the work of developing young men for success throughout their lives. I sincerely appreciate all you have done for Riverside to date, and I invite you to routinely contact me with your thoughts as we continue to rise!